Should a politician act upon practical necessity or be guided by theory? Cicero (1st century BCE) has several philosophers debate this question in ?On Public Affairs? (?De re publica? ), ending with the ?Dream of Scipio?, a vision of heavenly glories awaiting selfless politicians. Macrobius (5th century CE) commented on the 'Dream? through the lens of contemporary philosophy which argued a superior transcendent reality. The commentary?s mysticism and its views of geography (proposing a round earth) appealed to medieval theologians. 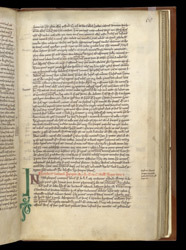 This manuscript?s handwriting style and inclusion of verses by Rhygyfarch (Ricemarch), poet of St David?s, link it with Wales. Near the end of the page, the red inscription signals the end of Cicero?s ?Dream of Scipio? and the beginning of Macrobius?s commentary. The marks shaped like the number ?7? abbreviate the word ?and? (?et?) and are typical of manuscripts and from early medieval Ireland and Britain.